Much of what is written on this site deals with the newest and most exciting hardware and vaping supplies available. 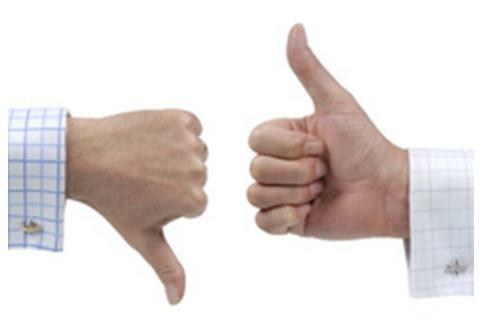 As electronic cigarette technology has grown more complex, robust and stylized, so have the reviews on Vaping Guides. A lot has to do with personal taste; we like our long lasting variable voltage APVs, so that’s what we write about. The problem is that most people don’t want to start out with something the size of small flashlight. Something that looks like a cigarette is often much more attractive. V2 Cigs recently contacted me regarding having their products represented on Vaping Guides. The ensuing conversation made me realize that it had been quite a while since I had sampled an electronic cigarette that really fits that description. V2 offered a kit to sample, and I was anxious to find out how their brand stacked up against the larger APV devices that I currently use daily. With the vast improvements in personal vaporizers, is there still a place for an electronic cigarette? V2 Cigs has been around from nearly the beginning in terms of electronic cigarettes. 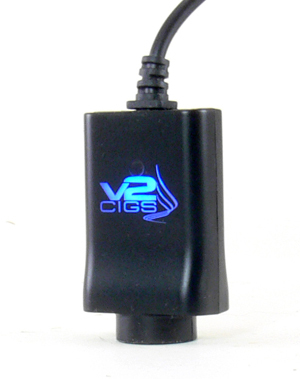 While the industry as a whole has been saturated with larger models, V2 has stuck to offering only electronic cigarettes. Rather than developing more complex devices, the company appears to have decided to improve on the basic model and further refine the company image that goes along with it. Let’s jump right into the review. The kit reviewed here is the Ultimate kit, which represents the most feature packed kit that V2 offers. It comes with three different batteries, a pass-through, 25 cartomizers, a personal charging case and regular carrying case, lanyard and car and home chargers. Everything comes in a very attractive flip top box that also contains a manual and discount coupon. The Ultimate kit comes at a rather daunting price, but the peace of mind of knowing that nothing else is needed to start vaping may just be worth it. The presentation is attractive enough that this would make a fantastic gift. 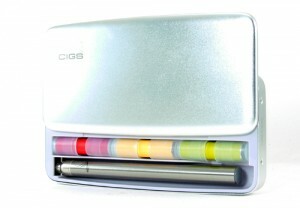 The Ultimate kit includes three batteries, which provides a great foundation for a moderate electronic cigarette user. Regular size automatic and manual along with a long automatic were included in my kit in white, black and chrome respectively. For those new to electronic cigarettes, automatic means that the battery is activated by simply inhaling on it while the manual is activated by the press of a button. All three batteries perform exceptionally well and seem to last a little longer than some competitors. These batteries are designed to be the size of a conventional cigarette, however, and as such are limited to the amount of time they will last between charges. Having one or two to charge while one is in use is a necessity that some new vapers overlook. To further ensure uniterrupted vaping, the Ultimate kit also includes the Power-cig, a USB powered passthrough battery that can be powered indefinitely from the wall or car adapter. The batteries can be charged using several different methods, including the USB cord or the personal charging case (PCC). The USB charger is another example of the attention to detail that V2 has put into their product. The charger has an attractive V2 logo that lights up in blue when connected to USB. The logo then turns red when a battery is charging and back to blue when it is fully charged. Its a simple thing, but adds to the overall impression of quality that this line of electronic cigarettes radiates. The charger can be powered by any USB port or attached to the included wall or 12v car adapter. Another convenient way to charge the batteries is found in the PCC case. The case itself is charged via USB, but once charged becomes a portable battery pack that can provide up to eight battery charges. 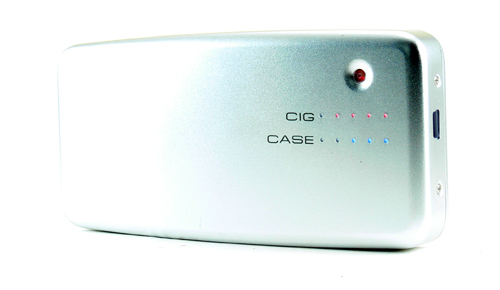 The PCC works for any of the included batteries and also has space for 3 cartomizers. Once again, it is designed well, with LED status indicators for both the case and the ecig that is charging and a top that slides smoothly and securely to provide access. One of the biggest improvements in electronic cigarettes over the years has been in the cartomizers that they use. The V2 Flavor Cartridges are definitely among the best cartomizers that I have tried. The Red and Sahara tobacco flavors are fantastic and will easily provide the satisfaction needed to switch to an electronic cigarette. The taste is full and rich and the vapor production is excellent. These cartomizers seem to last an exceptionally long time and when finished, the vapor simply tapers off rather than tasting burnt. 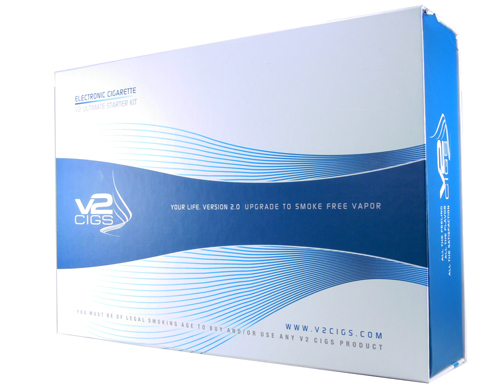 v2 Cigs has broadened the selection of flavors to include some sweeter flavors including cherry, vanilla and coffee, and all of these have been true representations of the flavors. The mint tea flavors was especially enjoyable, with its heavy mint inhale over the taste of green tea. The cartridges are stated to be roughly equal to a pack of cigarettes, and I think this is reasonable, if just a little optimistic. The flavor cartridges are available for as little as $1.50 each when purchased in quantity, so they represent a very cost effective alternative to cigarettes, regardless. These cartomizers have hard end caps that are difficult to remove, so refilling is not an attractive option, although V2 does sell blank ones for just this purpose. Along with an attractive website and well designed products, V2 also offers an impressive warranty on their products. The warranty covers the lifetime of the product up to five replacements, with the reasonable exceptions of damage or tampering. This is yet another way that V2 adds value and assurance for the new electronic cigarette user. Wondering what you’ll need to do to get started? This will be the shortest paragraph in this article. Just charge the battery, screw on a cartridge and inhale. That’s really all there is to it, and that makes for an easy transition from smoking. I must admit that I am often skeptical of really well designed marketing. Prior to trying this electronic cigarette kit, I had assumed that V2 ecigs were more about marketing than about performance. A week or two with the V2 proved me wrong. Yes, the marketing is very well done. Yes, the product is slick and well packaged. And yes, the price is a little high. But the level of confidence that comes with purchasing the V2 product may just be worth the extra cost. There are lots of lower cost alternatives, but only a few offer the complete ease of entry that V2 does. V2 Cigs does offer a number of less expensive starter kits ranging from a one battery Express kit through a nice mid range Standard kit. There’s also a disposable for less than $9, but keep in mind that disposables can’t be recharged and therefore are not a good value at all. Finally, V2 offers 15% off nearly all of the time and includes a coupon with every kit. Use it to order more supplies or give it to another smoker who could use a little prodding to make the switch. Note: In the spirit of full disclosure, the kind folks at V2 cigs sent me this kit to try free of charge and we will be carrying their advertising. That in no way influenced this review, and quite frankly, you wouldn’t be reading this if the kit wasn’t worth a look. In fact, the V2 product never appeared before on this site because I wasn’t convinced that it was a decent product. I am now. I tried Blu and sent it back for a refund. I tried Cloud 9 and that was not so bad, better than Blu in my book. Batteries kept dying. Then I stopped ecigs for about 6 months. Went to recharge my Cloud 9 stuff and they were a bust. I tried V2 and have not looked back. By far this is the best product I have tried. The USB Powered device is my favorite. Flavors are not bad cherry seems to be the one I like the best but still trying other flavors. Try V21 I think you will be happy, I know I was. V2 was my first e-cig and I’ve been a loyal customer for a couple years. Their products and customer service are great. I’m disappointed that they don’t offer a wider variety of e-cig types and styles, as I’ve decided to move on to bigger and better models. But I will probably still buy my favorite juice from them.